A new Human Rights Watch report details how hundreds of convicts were beaten, forced to carry supplies for the military – and clear landmines with sticks and forks. Last year, Yezaw was arrested over an unpaid restaurant bill. One evening in May, he and a group of friends met for dinner in the central Burmese city of Mandalay and ran up a tab they couldn’t pay. After his girlfriend’s father – a lawyer – accused him of stealing her motorbike to cover the debt, the 20-year-old was charged, taken to court and sentenced to 18 months in prison. Reeling from the apparent unfairness of the charge, Yezaw, now 21, said he hadn’t imagined what was to happen next. At the start of this year, he was transferred to eastern Karen State, close to the Thai border and, along with dozens of other prisoners, handed a dark blue uniform. For three months, he was forced to carry supplies for the Burmese military, enduring punishing jungle terrain, meagre rations and regular beatings for the smallest of infractions. The skinny student from Mandalay was just one of hundreds of convicts who were rounded up for porter duty during the Burmese military’s offensives in Karen State following last November’s national election, when rebels seized the border town of Myawaddy and attacked army units. Yezaw’s story is echoed in a new report by Human Rights Watch (HRW) and the Karen Human Rights Group (KHRG), entitled Dead Men Walking: Convict Porters on the Front Lines in Eastern Burma. The report estimates 700 prisoners from 12 prisons and labour camps across the country were transferred to Karen State to perform military labour during this year’s fighting. The report documents how civilian prison authorities, in collusion with the military, selected prisoners for porter duty ‘without any clearly stated criteria’ and forwarded them to conflict areas in a series of coordinated sweeps. 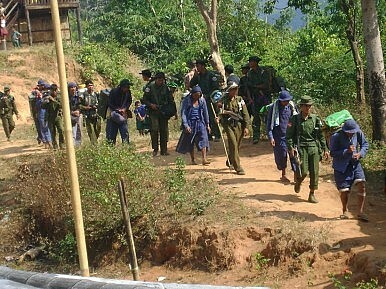 ‘The men were a mix of serious and petty offenders, but their crimes or willingness to serve were not taken into consideration: only their ability to carry heavy loads of ammunition, food, and supplies for more than 17 Tatmadaw (Burmese army) battalions engaged in operations against ethnic Karen armed groups,’ it states. The report, based on HRW and KHRG interviews with 58 convict porters who escaped to Thailand, claims that porters used during offensives between 2009 and 2011 endured ‘horrific abuses’ at the hands of the Tatmadaw, including summary executions, beatings, torture, and the practice known as ‘atrocity demining,’ where porters were sent ahead to detect landmines with inadequate equipment and next to no training. HRW and KHRG describe the practice as a ‘wilful deferment of military obligation onto a vulnerable civilian population’ – and a potential war crime. The Burmese junta’s decision to close a Thai border crossing has prompted frustration and questions—and no answers from Burma.